How tall and wide should the desired spray pattern be and what nozzle will provide the desired pattern? How much horsepower will be required to obtain the desired spray pattern? How much will it cost to operate the fountain and is that within the operational budget? How much will it cost to maintain the fountain and is that within the operational budget? Do you want lights on the fountain? How many and what wattage? How far will the primary viewing distance be? What electrical requirements are needed to operate the desired fountain including lights? 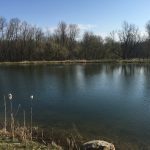 Should the cable be protected from muskrats and other rodents? 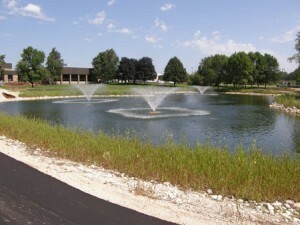 Is the pond deep enough to support the fountain? 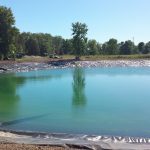 Will excessive debris in the pond cause continual plugging of the intake screens? 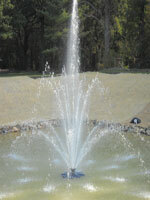 If multiple fountains are utilized, can a custom control panel be used? 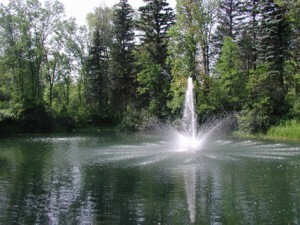 Does the fountain require wind control shutoff switches? Are there permit requirements that may restrict a typical installation? 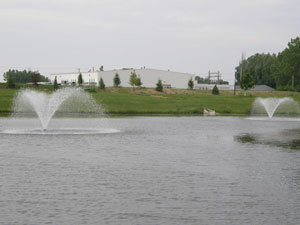 When you get ready to choose a fountain package for your pond, let the experts at Wisconsin Lake & Pond Resource LLC help guide you through the many options available. 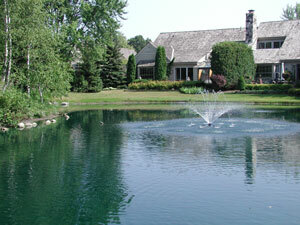 WLPR staff are very knowledgeable and willing to suggest treatments/overall pond maintenance plan. Cory spoke to our association to help explain the maintenance needs. Thanks for the service ‘above and beyond’! !